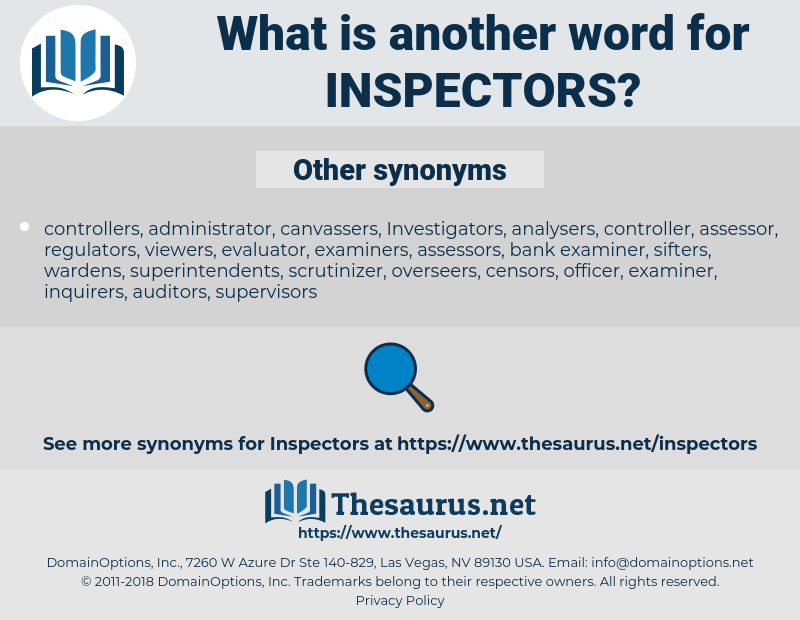 What is another word for inspectors? visitors, servants, examinations, rapporteurs, members. office, government, visiting, branch, inspecteur, council, iraq, baghdad, Inspecting, sergeant. interrogators, supervisors, investigations, auditors, procurators, censors, Interviewers, commanders, surveyors, checkpoints, personnel, monitors, Specialists, overseers, visitors, servants, regulators, examiners, ombudspersons, accountants, examinations, controls, requirements, rapporteurs, Researchers, check-ups, searchers, enquiries, followers, testers, assessments, viewers, verifiers, observers, audits, Organizations, Surveys, guardians, arms, Tests, handlers, checks, Missions, searches, NATIONALS, watchdogs, equipment, comments, panel, aspects, guests, hunters, access, team, teams, hours, weapons, visits, Drives, players, iraqi, handles, pool, compliance, iraq, supervisory. 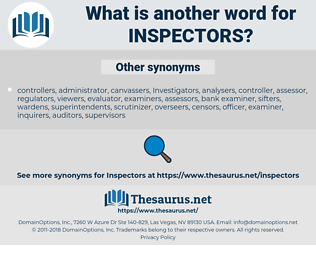 detective, compliance, inspectorate, inspectorates, superintendent, inspection, inspections, commissioners, lieutenant. prosecutors, comptrollers, controllers, officials, agents, drivers, inspectorates, inspection, inspections. She devised a system of visiting inspectors which kept track of all the families in their rapidly growing list.